I created a delicious spelt starter at the beginning of February and made some great loaves from it recently. 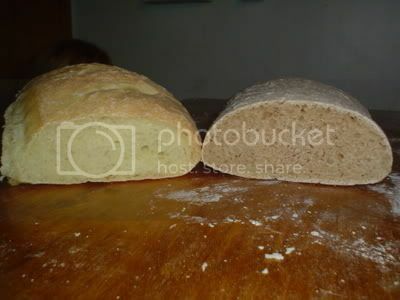 The one on the left was a 50/50 organic AP with organic light spelt flour (I can only afford 2.5 kg bags of spelt and ran out) while the one on the right is a 100% light spelt loaf. Both were excellent! The kids liked the 50/50 while I found the 100% to be exactly like pumpernickel in texture, great spread with peanut butter or pb/banana/honey! I used Sourdolady's recipe for starter but reduced all liquids by 25%, otherwise too much liquid and the starter never matures. After a week the starter was active, not as much as white or rye, and definitely not as volatile as whole wheat, but it was bubbly and produced a pleasant aroma. You can use either whole or light spelt with no loss of nutrients as they are contained in the germ not in the bran as in wheat. Kneading took about 20 minutes, but my house is cool these days which affects proofs immensely as well. However unlike all my sourdough experiences (save for yeats spiked variations), this spelt sourdough had far faster and greater second proofing results than wheat or rye starter. This is going to be my main bread, and if the kids continue to enjoy it then I should experiment with spelt cinnamon buns soon too. I smelled my starter before I baked today. It was trying to tell me something. In the begining, this starter was never very sour, but now at one month old it has changed and can be where ever I steer it. This one had been mildly neglected this week and got pretty powerful. It told me it was going to be very sour and I don't like "very sour." I should have waited a day or two and washed the starter until it smelled like what I like to eat. Next time I crank up a starter to cook with in a day or two, I'll not only shoot for volume but also taste.